Beach Reunion is a small company focused on big results for our owners. We can give you and your home the attention that you deserve. 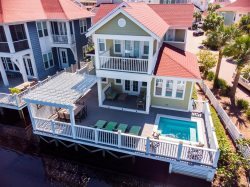 During 2018 our vacation rental homes were 95% booked from May 23 through August 15. Our management fees are among the lowest in the industry and we pay for many things that other companies will charge to the owner. If you would like more information or to request a blank contract please call us or send us an email! What are your management commission rates? Our rental commission rates are among the lowest in the industry. This is one aspect of our company that sets us apart from our competition. Call or send us an email to receive an exact number. When it comes to your home, we believe it is our duty to help you protect your investment. Our remote owners count on us to be their "eyes". The owner of Beach Reunion operated a home inspection company for more than 10 years and personally visits every home. We also conduct periodic inspections by a third party company. When major maintenance issues arise, we will be completely honest with you. We believe that absolute transparency is the only way to operate. Credit card fees and administration charges can really add up when you own a large home. Most credit card processing companies charge between 2 and 3% of every reservation and proprietary rental software companies can take up another 1 to 3%! Many area companies pass these charges on to the owners, but as a Beach Reunion owner, you will never pay these fees. We aggressively market your property through online listings, SEO optimization, social media and much more! Our homes are listed on our website and more than 7 other sites such as Flip Key and VRBO. The only marketing charge our owners pay is an annual fee of $1200 to be listed on VRBO, Home Away, and VacationRentals.com. We do not just list your home on these websites, we optimize your listing and keep it current so that your property is ranked as high as possible and is seen by more potential guests. We have a marketing specialist on our full time staff who is always available to our owners. We professionally photograph your property at no charge. Not only that; we keep our photographs updated. The days of seeing a 4 year old picture of your living room that was taken two sofas ago are finished! Beach Reunion will arrange for your property to be professionally filmed for use across all websites. The videos will also be used in various marketing campaigns and for advertisements paid for by Beach Reunion. We have been involved with many transitions from a different management company to Beach Reunion. Our staff ensures that the turnover is smooth and headache-free for our new owners. We will work with your current management company and keep an open line of communication with them during the process. Our new owners are always shocked at how easy the transition was! Do not let the fear of changing management companies stop you from getting more out of your investment.